Everyone knows that cigarettes are dangerous, both first-hand and second-hand. They cause cancer and a variety of other serious health concerns that can become more debilitating as we age, but how often are they a firestarter? Believe it or not, cigarettes are one of the most likely causes of any fire, causing nearly 25 percent of U.S. deaths. There are about 1,000 fatalities annually after out-of-control fires are caused by an unwary cigarette smoker. The victims don’t just include the smoker. They include friends and family, bystanders, and children. In addition to deaths, there are around 3,000 injuries each year in the U.S. according to a report made by the National Fire Protection Association (NFPA). The dollar amount in damage reaches about a half billion. This figure includes personal and public property. The total annual cost when health care and loss of productivity are factored into the number soars to about $4 billion. 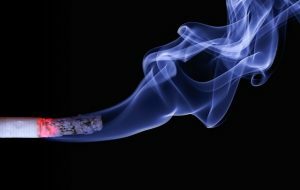 Even though fire safety precautions and cigarette fire awareness programs continue to be implemented all over the country, the numbers are growing. Other sources of fatal residential fires include heaters, electrical malfunctions, cooking accidents, and arson. The reports indicate that more fires caused by cigarettes result in death than any other source. The estimated reasoning for this skewed figure is simple: if you fall asleep with a lit cigarette, you’re asleep. You can put out the fire before it spreads. Part of the reason cigarettes are such a dangerous source of fire-related accidents is because of the way they’re manufactured. In order to increase the longevity of each cigarette, they continue to burn even when no one is around to inhale them. That’s great for the smoker who won’t have to relight after a sudden gust of wind or a moment or two in the ashtray. It’s terrible for fire statistics. Cigarettes often remain lit in smoldering fashion for over a half hour before a fire begins. They most often start fires in couches or in piles of material that are required for the smoldering process to catalyze. Without this type of burning a fire cannot develop. Aside from preventing smokers from obtaining cigarettes, manufacturers could do more to reduce the chances of this type of fire by slashing the diameter of the product. In addition, the packing could be less densely filled and the paper could be altered to reduce the amount of oxygen flow. ← What Causes Wildfires In California?